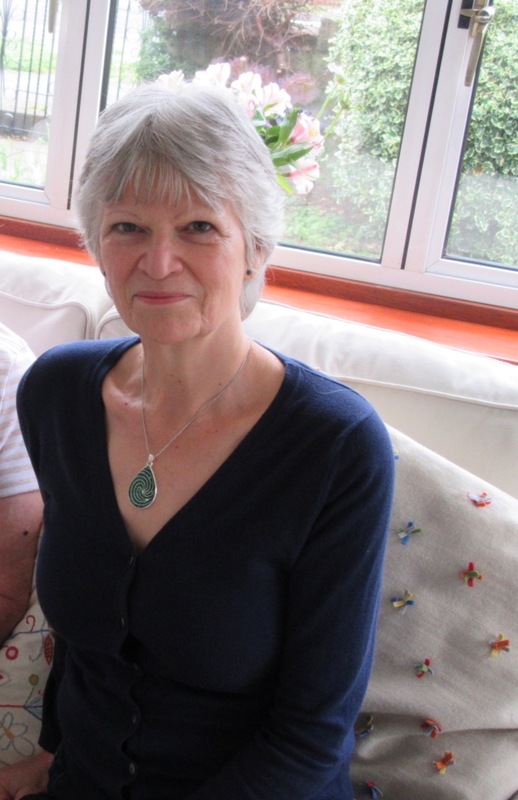 Please meet our next Guest Chris McGowan @ pearsnotparsnipsdotcom giving us some insight as she put it in her own words, the Baffling World of Health and Nutrition! I have a couple of confessions to make: I’ve never eaten a wrap and I’ve never shopped in Tesco. There, I’ve said it. As a health-conscious gluten-free vegan, I avoid most processed foods. I also avoid supermarkets. I have become used to looking at ingredients labels and sighing as I return the item to the shelf because it contains dairy or gluten or egg or a number of impossible-to-pronounce chemicals I wouldn’t touch with a bargepole. So, mostly I don’t even bother to look. I cook from scratch and use a few store cupboard staples along the way: Kallo stock cubes, Natex yeast extract, Tamari, pasta, tomato purée and tinned beans/chickpeas, but nothing major. Then two things happened: Firstly, I found myself in Tesco. I’m still not sure how. Earlier, we had been to the local garden center to see if they would sell me the split bag of cobbles I’d noticed on a previous visit (for rock painting, see my blog for how this new creative activity came about). Success, they sold it to me for less than half price! Next, we had to return a couple of items to M&S and swap them for the correct items (Husband had bought the short, strappy vest instead of the long, wider-strap vest), again, success. Finally, Husband says he needs some marmalade and the only place he can buy the brand he likes is Tesco. Now, normally he goes off and does this and I stay at home. I would rather watch paint dry than go to the supermarket. I have a dread of supermarkets. Especially huge supermarkets like Tesco and Asda. Row upon row of tubes of toothpaste. It makes my head swim. Too much space, too many items that look the same, too many people. If I go at all, and it’s very rare, it’s to our local small Waitrose or Aldi and it’s for a definite item or two. This time, for no sane reason, I decide to go in with him. I stare straight ahead and just follow him. I stand, looking at the ground while he chooses his marmalade. And then he leads me to the Free From section by the wall. I groan. Commercial free-from foods are mostly laden with sugar or salt or chemicals and taste like cardboard on a sugar-high. They are expensive and often unhealthy, so having fallen prey to them when first being gluten-free (and when we’d discovered the younger members of the family were coeliacs), I didn’t want to look. However, Husband reminded me of the BBC’s ‘Eat Well For Less’ tv programme that had featured a family with two daughters who were coeliacs for whom the presenter had found a Quinoa and Chia Seed wrap that they liked. We hadn’t been able to find them locally. Here they were, in Tesco, in the Free From section! They are made by a company called BeFree and what’s more, they also do a Sweet Potato wrap, so we bought both. I was so pleased, I forgot to stare straight ahead on the way out and arrived at the till with half the Indian foods section in my arms: two types of gluten-free Bombay mix that didn’t have monosodium glutamate (for Christmas), garlic and coriander poppadoms, mango chutney (the first ingredient is sugar but this will be used sparingly when the family are here, the boys love their curry!) and some rice noodles. And so to the wraps. I tried the sweet potato wrap as soon as I arrived home. It was way past lunchtime and I was starving, having only had a smoothie all day. 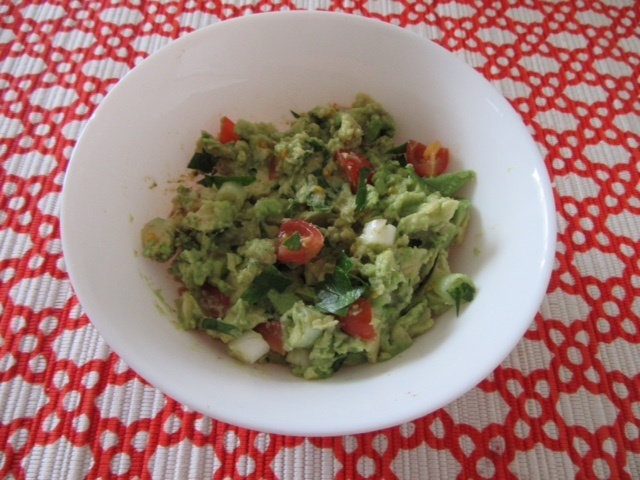 I put one in the oven on a low heat to warm through, then quickly made some Chilli Spiced Guacamole with coriander, chopped some romaine lettuce and cucumber and grated some carrot. Rolled it up, cut it in half and Bob’s your uncle! It was delicious. And very filling. One was enough to take me through till dinner. 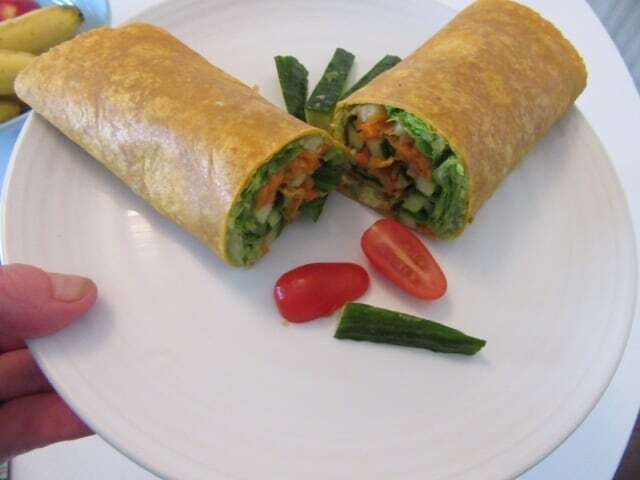 These wraps are high in antioxidants and vitamin E and also contain pea protein. A couple of days later, I tried the Quinoa and Chia Seed wrap. It also contains teff and flax seeds, and pea protein. Chia seeds are a favorite of mine, they are high in calcium. Flax seeds are high in protein and B vitamins, while teff seeds are high in iron and a good source of healthy omega 3 oil. Being high in fiber, these wraps are good for your gut, and they contain 3.2g of protein per wrap, compared with 1.9g in the sweet potato wrap. For this version, I cooked some quinoa in a little vegetable stock, a few chili flakes and added some mixed beans when ready. 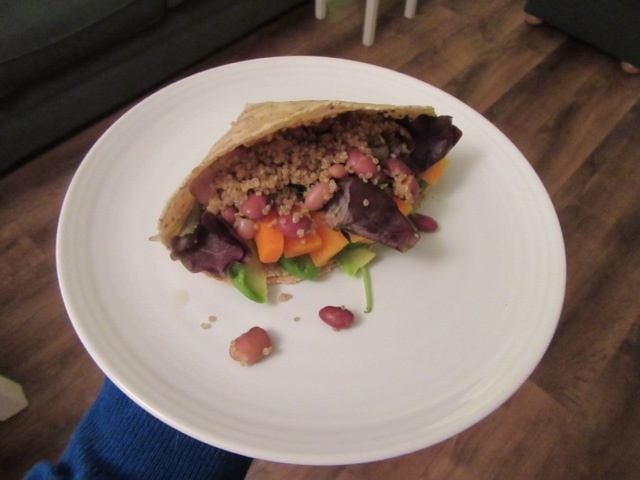 I also steamed some carrot sticks, folded the warm wrap into a pocket (so the quinoa wouldn’t fall out) and filled with the quinoa mix, carrot, mixed lettuce leaves and chili-spiced slices of avocado. Delicious. I can see why wraps are popular. They are great for lunches, and make a healthy salad a bit more substantial and appetizing, especially in colder weather. I love a big salad, but even I waver when the temperature drops. This way, I will still enjoy fresh, healthy raw food in a new, satisfying style of eating. I rarely eat bread: as many of you will know, commercial gluten-free bread is pretty awful and although homemade is better (see my blog for recipes), I freeze most of it, so it isn’t always convenient to use. Thank you to Esmé for this opportunity to write for her blog, and thank you for reading. All comments welcome. Enjoy it, just love all the new and wonderful ideas from our fellow bloggers. No problem, I made the correction! Thanks again for sharing and being a Guest. Anytime in future you wish to do another, just drop me an email and consider it done. Thanks and all the best for Christmas and the Festive Season. Lovely post, Esme. So many people have to be gluten free. Merry Christmas hugs! It’s so good to see my friend @thejuicenut guesting. Her recipes are always wonderful and I have shared them with many family members and friends. This is a great post and I hope she will come back and guest for you again! Awesome comment. And I agree with the wonderful recipes. 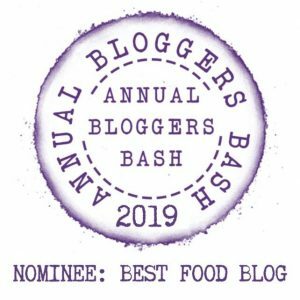 I would love each of my Guest psters to come back and share more posts, would you like you start thinking about a follow up Guest post for next year. I am thinking – this is my promise!